NYTimes: It's pretty to look at and it contains a number of good performances, but there is something exhausting about its neat balancing of opposing manners and values. Thus the vicious, city-bred violence, which initially motivates the plot, is contrasted with the halcyon simplicity of life down on the Amish farm, and the uncomplicated affection shown John Book by Rachel and her small son is seen against the exhausted worldliness of John's other relationships. A scene in which John is taught how to milk a cow is followed by one in which John teaches the innocent Rachel how to dance. When John must face down the crooked cops who pursue him to the farm, will his Amish friends forget their pacificism? 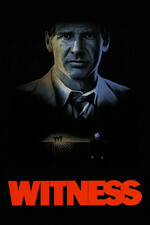 Roger Ebert: Up until the return to Pennsylvania, "Witness" has been a slick, superior thriller. Now it turns into an intelligent and perceptive love story. It's not one of those romances where the man and woman fall into each other's arms because their hormones are programmed that way. It's about two independent, complicated people who begin to love each other because they have shared danger, they work well together, they respect each other - and because their physical attraction for each other is so strong it almost becomes another character in the movie. This is a movie that's actually better than I remembered. My favorite part is the last ten minutes or so when there's virtually no dialog. I saw this in the theater when it came out, but haven't seen it since. Like probably an embarrassing number of people, this movie constitutes the sum total of my awareness of the Amish, and I see references to the movie all the time. Viggo Mortensen had a small role in this. Yeah, poor Kelly McGillis had to say goodbye to Harrison Ford and settle for Viggo Mortensen. My heart aches for her. No, she had to settle for the late Alexander Godunov. This was the first R-rated movie I ever saw in the theater. I grew up in Lancaster and the movie's filming seemed like such a big deal at the time. I think my mom may have gotten a glimpse of Harrison Ford in downtown Lancaster at some point, and in my recollection the excitement was on par with her actually having met him. In fact, it may be possible that she was even just speculating about the possibility of maybe catching a glimpse of him. In any case, I was allowed to see the movie when it eventually came out. And then thirty years passed and I never saw it again until I watched it last winter. It turns out, it's really a good movie! I thought it held up great over the decades. Really nicely written.